Hakone is a popular holiday destination, reachable in about one hour from Tokyo by train. The area is most famous for its hot springs. In the Sengokuhara area of Hakone, there are many art museums, making this a place where visitors can fully enjoy art and hot springs. 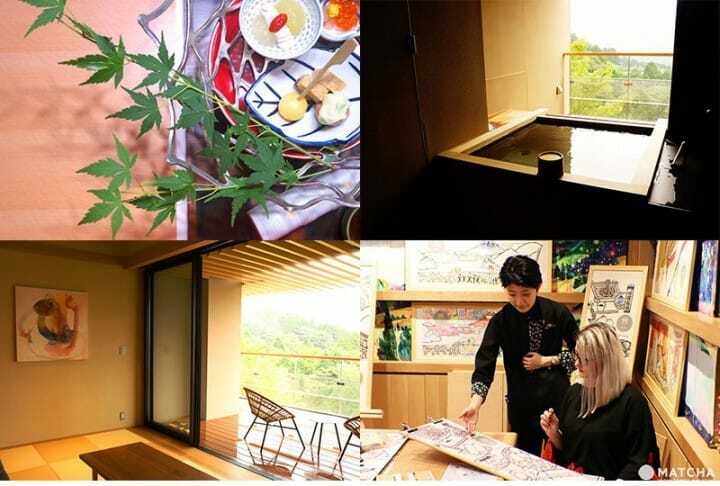 Visitors to this area can enjoy both art and hot springs at Hoshino Resorts KAI Sengokuhara, a hot spring ryokan that opened in July 2018. Hoshino Resorts KAI Sengokuhara is designed as an "atelier onsen ryokan". From the reception desk to the guest rooms, every corner of the facility is full of art. Guests can spend their time here as if they were in a gallery. Not to mention that there are many works that can only be enjoyed here. In this article, we introduce to you the features of KAI Sengokuhara through the eyes of a MATCHA writer who experienced it. All the rooms at KAI Sengokuhara have a view of the splendid hills and forests that offer a different landscape every season. Each room is decorated with unique paintings. These paintings were all created by twelve artists who took part in the "Hakone Sengokuhara artist in residence" program that was held before the opening of the facility. The artists have stayed themselves in these rooms and created works inspired by the landscape visible from the room. The room I stayed in was decorated with a painting by Spanish artist Jerónimo Maya Moreno. This piece of art was inspired by the wonderful nature of Sengokuhara and was very impressive. Other beautiful elements of this room included the lampshade made by the glass manufacture ipada and the keyholder made from acrylic glass, which were adding to the artistic charm of the room. While staying at KAI Sengokuhara, guests can enjoy wearing a yukata, which is a light casual kimono. The amenities are wrapped in a furoshiki (Japanese wrapping cloth) which can be taken home as a keepsake from KAI Sengokuhara. This cloth can be made into a small bag to carriy small things around the ryokan or can be used as a decoration. 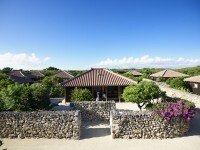 To learn more about the rooms at KAI Sengokuhara, please visit their official webpage. If the views and art inspire you, visit the Atelier Library. This is a place where guests can release their imagination to create beautiful works. Atelier Library has all the art supplies one would ever need, with beautifully lined pigments from deep reds to calm blues resembling the changing skies from dawn to dusk. You can take your favorite color and start drawing on the paper available on the table. In addition, two times a day, from 16:00 and 21:00, there is a "Towel painting" workshop being held here. Participants can choose from several Japanese towels with different designs and color it with special crayons for cloth. The patterns on the towel that I chose featured nature views and local foods from Hakone. All these patterns have been drawn by stencil dyeing (*1) artist Mitsuko Ogura. The staff will explain to you how to use the crayons to color your towel the way you like. The task of coloring this towel is extremely fun and relaxing. You'll forget about the passing of time. At the end of your stay, you can take your creation home as a souvenir from KAI Sengokuhara. *1 Stencil dyeing... A cloth dyeing technique that makes use of wooden and paper forms. In the salon located in the adjacent building, every Sunday, the facility hosts workshops of traditional Japanese arts and crafts such as bonsai and caligraphy held by renowned artists. The workshops that you can experience as a guest at KAI Sengokuhara will help you discover your artistic side. For more details on the activities that can be enjoyed at KAI Sengokuhara, please refer to their official website. The hot springs at KAI Sengokuhara draw their rejuvenating waters from the Owakudani Valley. The water is pH 2.0, slightly acidic, and said to be very good for the skin. Guests can enjoy the hot springs either in the communal bath or in the open-air baths on the balcony of their own rooms. These hot spring bath areas are gender segregated and include several types of bathing facilities. The indoor baths have two types of hot spring water, with different temperatures. The one with the highest temperature is recommended if you want to soften your skin and clean the impurities. In the bath with the lower temperature, you can spend more time relaxing. The outdoor bath is surrounded by trees and you can enjoy the great view, feeling as if you were in a forest. The Yuagari Lounge, where guests can take a rest after their bath, is located right between the two shared bath halls. The refreshing drinks offered here, mikan orange juice and tea, can help you cool down after a dip in the onsen. One of the special features of KAI Sengokuhara is the fact that every guest room is provided with an outdoor bath. This means that you can enjoy a bath leisurely any time you want. After the hot spring bath, you can pamper yourself with an in-room massage. It will put your blood in motion and make you feel deeply relaxed. Guests can choose between several types of massage, from relaxing types to intense muscle massage, depending on how they feel that day. To learn more about the features of the hot springs at KAI Sengokuhara, please visit their official webpage. Dining at KAI Sengokuhara means enjoying exquisite culinary art. The cuisine is made with local ingredients and capturing the tastes of the season, being at the same time beautifully arranged on gorgeous dishware. For dinner, you will enjoy a Japanese Kaiseki course meal. The main dish, Sankai-yaki, is cooked on a heated stone. Duck and beef slices, fish and shrimp are being grilled on this stone. The ingredients represent the main natural features of the area, the mountains and the sea. This exquisite dish was inspired by the location of Sengokuhara, close to both the mountains and the sea. We visited at the beginning of autumn and our dishes reflected the change of seasons in both flavor and appearance. The dessert was made with chestnuts, a typical autumn ingredient. Breakfast is just as beautiful and filling as the dinner. It is made with wild yam and fish paste, a specialty of neighbouring Odawara. Guests enjoy dinner in the elegant dining lounge of the facility, which has an artistic structure itself that allows guests to enjoy their meals in privacy. You can find more details on the cuisine and dining options available at KAI Sengokuhara on their official website. If you plan to visit Hakone, how about staying at KAI Sengokuhara? Not only will you get a firsthand experience of Hakone's nature and culture, but you will also be able to relax and recharge in an exquisite resort full of art. The fine Japanese cuisine and hot spring facilities in this resort blend wellness and art, soothing one's body and mind. During your stay, you can ask the staff for art museum recommendations and visit some of the art facilities in the area. Take the time to enjoy the art and hot springs of Sengokuhara and it will surely become a trip to remember. For more information on Hoshino Resorts KAI Sengokuhara, please visit their official website: https://kai-ryokan.jp/en/sengokuhara/#top. You can check room availability on their booking page. Read more reviews of other Hoshino Resorts facilities in our Hoshino Resorts Special Feature.